Our oldest, Shaggy, who is in his senior years (Shaggy is 13+), is suffering from Degenerative Myelopathy. Up until a couple of months ago, Shaggy could get up off the floor with the help of something; like a carpet remnant or a rubber mat, by himself. However, he has had a lot of issues with this maneuver of late and has become incapable of the same. In addition, in our home in Roswell, we have to climb down at least 5 steps in order to reach street level. Shaggy tripped on these steps a couple of times and has gotten very scared of them. He is so scared that he won't climb up the steps at all. So, we asked Shaggy's Vet how to proceed. One of her recommendations was to help Shaggy by getting him a proper harness, which will help us carry him or help him get off the floor and also possibly climb some steps, if need be. The long range plan is for me to build Shaggy a 14 foot ramp from our porch to the front yard. 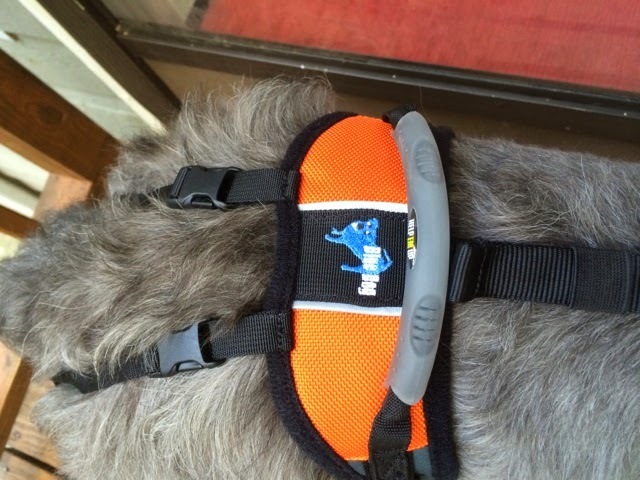 Upon Shaggy's Osteopathic Vet, Dr. Kim Parker's recommendation, we got Shaggy a Help'Em Up harness from Blue Dog designs. Shaggy weighs roughly 70 LBS and a Medium fits his very well. 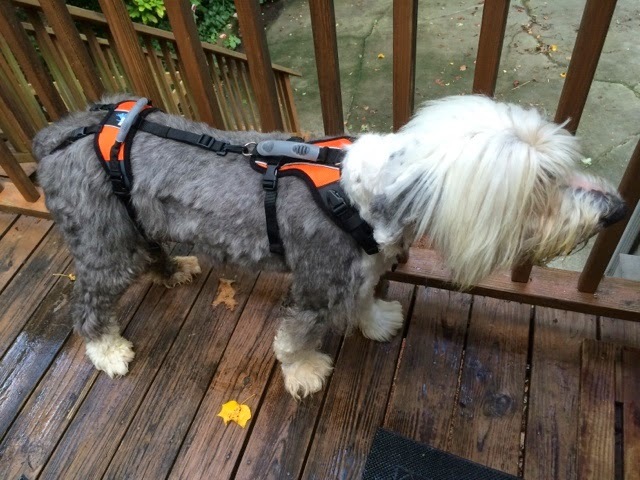 Below is a picture of Shaggy with the new harness, which fits him very well. 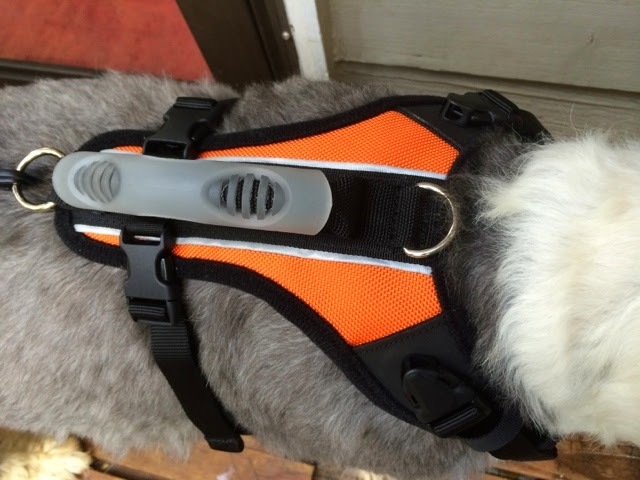 The Help'Em Up harness is very well made and is appears to be quite strong. There is a handle in the front, right behind the shoulder. And, there is one right in front of the back legs. One can help a mobility-challenged dog, like Shaggy, whose biggest hurdle is getting up, using the two handles on the harness. In fact, I am able to help Shaggy gently climb the steps, until the ramp is built. I use the phrase, "Suitcase Dog', to describe the way I help/carry Shaggy up the steps. It is not very difficult, but needless to say, one needs to be extra careful, for the safety of all involved. 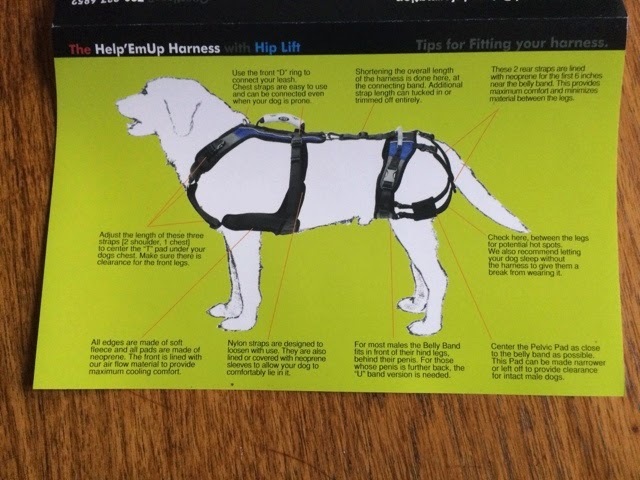 The diagram below (courtesy of Blue Dog Designs), shows how the harness should be fitted on a dog and its fine features. Currently, Shaggy is also getting Swim Therapy from Wag'N Swim. Working with an ailing animal, as many of us know, requires a lot of patience. Shaggy has taught me a lot, especially in the last few months. If you know someone, who has a dog suffering from a similar problem, perhaps you could tell them about the Help'EmUp Harness. I do not profit in any way from promoting the product. It is simply that I want to help pet parents and pets who have Degenerative Myelopathy.